Dental Fear is the second most common phobia and up to 50% of the population puts off visiting the dentist because of their fear. Dr. Nugent understands these fears and takes them very seriously. Dr. Nugent provides Sedation Dentistry utilizing Nitrous Oxide (laughing gas), oral medication and a combination of nitrous and pills. Sedation Dentistry is the perfect solution to dental fear anxiety. It produces a relaxed, comfortable state in even the most frightened dental patient. 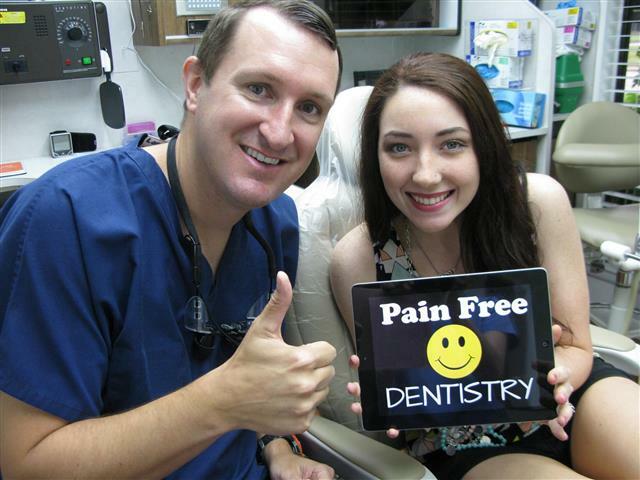 Dr. Nugent holds several permits from the State of Texas to administer needle free sedation at his Pasadena, Texas Dental Office. Sedation dentistry helps patients overcome fear, anxiety and severe gag reflexes. Sedation allows patients to be comfortable in the dental chair. Furthermore, sedation dentistry makes hours seem like minutes and most patients say they “slept” through the procedure. This allows Dr. Nugent to preform major procedures all in one visit. Another great advantage of sedation dentistry is that the medication causes patients to not remember their dental visit. Sedation dentistry is right for you if you have: anxiety about going to the dentist, fear of dentists, strong gag reflex or need major procedures. Is Dr. Nugent, a Pasadena dentist, qualified to perform sedation dentistry? 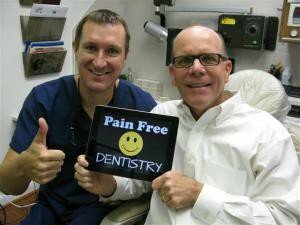 Pasadena dentist Dr. Nugent has been providing dental sedation and working with dental phobic patients for over ten years. He holds multiple permits from the State of Texas to preform sedation dentistry at his office. Sedation Dentistry is a process using pharmacology methods to create a relaxed, easy, and calm state. Dr. Nugent uses nitrous oxide (laughing gas), oral medication and a combination of gas and oral medication. The pills are taken at the office prior to your dental procedure. If the nitrous oxide gas is used it is administered immediately before your dental procedure. Does sedation dentistry put me to sleep? NO, sedation dentistry does not put you to sleep. However, you are so relaxed and comfortable that patients feel like they are sleeping or in a dream-like state. In reality, sedation dentistry retains a level of consciousness for patient cooperation and safety. You will be so relaxed and comfortable, but if you are cold you will be able to ask for a blanket. What is needed for a sedation dentistry appointment? Wear loose comfortable clothes, no contacts, and no eating or drinking for 8 hours before your appointment. Ladies cannot have any nail polish on their fingers. Nitrous oxide only sedation you do not need anyone to drive you home. The nitrous oxide is completely cleared out of you before you dental procedure is finished. 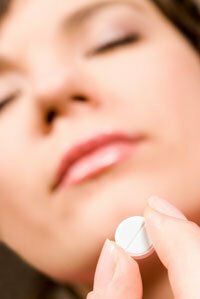 For oral medication sedation, you will arrive at our office and take your medication. After the procedure you will have a caregiver drive you home and stay with you for a couple of hours. Absolutely! Nitrous Oxide is extremely safe and has multiple safety features built into the equipment. While on nitrous oxide you will be breathing in a greater concentration of oxygen than normal atmospheric air. The oral medications have long safety records. Medical doctors prescribe these medications for patients to use at home with NO supervision. When you take the oral medication Dr. Nugent will be right there monitoring you. You will be attached to a machine that records and monitors your oxygen saturation, pulse and blood pressure. What procedures are suitable for sedation dentistry? Any procedure! Sedation dentistry is about making the patient as comfortable as possible. Dr. Nugent has utilized sedation for simple fillings. It is all about the patients comfort. Does insurance pay for sedation dentistry? Dr. Nugent is a leader in quality dental care. He devotes a huge part of his dental practice to helping patients with fear and anxiety. Dental sedation is a safe and effective procedure that will help you feel calm and comfortable during your dental visit. Dr. Nugent sees patients from Pasadena, Deer Park, La Porte, Friendswood and League City. Discover why Dr. Nugent has been voted BEST PASADENA TEXAS DENTIST multiple times. Call our office today at 713-941-8261. Our amazing dental office is located at 3421 Burke Rd Ste A, Pasadena, Texas 77504.